The original Hebrew word for “gracious” in this verse is chanan, which means to be graciously inclined toward someone; to have compassion on someone; to bestow favor on a person in need. It speaks of God’s compassion, generosity, and kindness towards us. Even when we sin, we can expect Him to be gracious to us as we seek His forgiveness. God does not hold grudges like human beings, and is always predisposed to pardon and restore us once again. Because Jesus died and shed His blood to pay the penalty for our sins (past, present and future), we should never be afraid to approach our loving Heavenly Father when we do wrong. Instead of running away from God we should run quickly to Him, admitting our wrongdoing and asking His forgiveness. We should approach Him confidently knowing that He still loves us and takes pleasure in being compassionate, gracious and forgiving. The Bible teaches us that God is very merciful by His own choice and by His very nature. “Therefore Yahovah will wait, that He may be gracious to you; and therefore He will be exalted, that He may have mercy on you…” – Isaiah 30:18. “If we confess our sins, He is faithful and just to forgive us our sins and to cleanse us from all unrighteousness.” – 1 John 1:9. If you’re bearing a burden of sin today, pray right now to God, in Jesus’ name, and confess your sins to Him. Wherever you are, no matter what you’ve done, He will hear you; He will be gracious and merciful to you because, that’s just how God is! – From the song “Mighty To Save”, by Hillsong United. 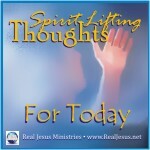 Categories: Everyone Needs Compassion, GRACE FOR TODAY | Tags: Forgiveness, God's Compassion, Love, Mercy | Permalink.